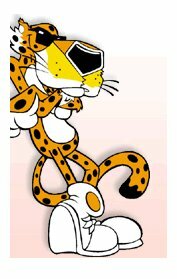 Chester Cheetah is the ideal candidate for president. He will turn the oval office on it's head. His plans to harness the power of cheese are unprecedented. Keep Chester in mind when you are casting your vote. Remember, a vote for anyone else is "Dangerously Cheesy!" Out of the users that have visited this site 36 out of 65123 say they would write in Chester Cheetah if they knew the write in would help get him elected for president. (Not every candidate is registered/eligible for write in votes in every state).